With three full-length albums to their credit, Norwegian Extreme Metallers PANTHEON I have gone old-school and rereleased their 2006 debut album “Atrocity Divine” as a limited edition tape. Commented front man Andre’ Kvebek: “I think a lot of people still remember the days of tape releases with a certain fondness and even those who weren’t around at the time associate tapes with the beginnings of the underground scene, and it was definitely something we wanted for at least one of PANTHEON I’s releases, so when the opportunity arose, we were more than happy to say yes”. The tape version of “Atrocity Divine” is released on Silent Scream Records on the 10th September, and is limited to 150 copies. Artwork is by the Norwegian artist Kjell Åge Meland. 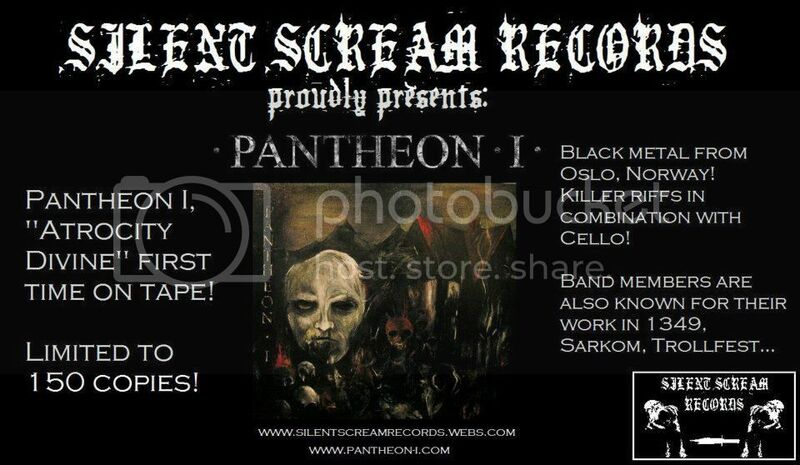 Formed in late 2002 in Oslo, Norway, PANTHEON I’s music combines brutality, aggression and speed with melodic interludes that, unlike the majority of bands, are not played using synths and string samples, but on the cello by classically trained Live Julianne Kostøl. The band’s line up underwent a change last year with the addition of former ABSU guitarist Aethyris McKay, who not only contributes his writing skills and clean vocals to the band, but also allows frontman Kvebek (DEN SAAKALDTE, ex-1349) to step out from behind his guitar on stage. As well as Kvebek, McKay and Live Julianne, the line up includes Sagstad (TROLLFEST, SARKOM) on guitars, T.R.S. on bass (1349, DEN SAAKALDTE) and MADS G on drums (THE ALL SEEING I, ZEENON).